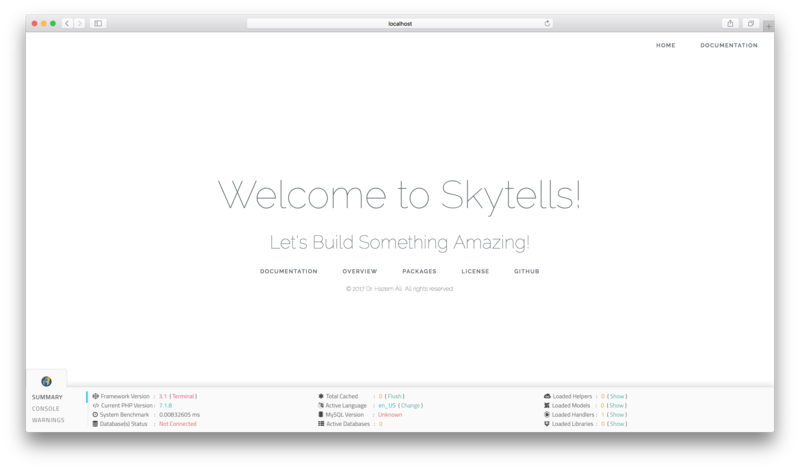 Who is Skytells Framework For? Fast, Powerful and Easy to use! Built-in Ready HTML5 ( 404, 505, 403 ) Pages. Built-In Embed System for Social Networks Development. Advanced CLI & Analytical Tools. Advanced ( MVC ) - ( HMVC ) Support. Powerful Engines for DB, etc. Yes, It's FREE and always will be! Skytells PHP Framework is an open-source PHP framework licensed under MIT license. Copyright © 2017 Skytells, Inc.